I am of Puerto Rican and Italian decent, and since I grew up on the Italian side I didn’t have much exposure to Puerto Rican cuisine. I also left New York as a young teenager and moved to Canada, there’s no Puerto Rican community, let alone restaurants there. While visiting Orlando, Florida we found a wonderful place of inspiration, Tropico Mofungo, a wonderful authentic Puerto Rican restaurant. In just one sitting I was inspired to do some research and start on my quest to create some Puerto Rican inspired dishes. 1. Using a Dutch oven fry the ham (or pancetta) in 2 tbsp of olive oil with medium heat. 2. When the ham becomes cooked to your liking add the Recaito herb-blend and cook for 3-5 minutes, stirring constantly. 3. Add the Sazón con Achiote y Cilantro, Adobo, turmeric and hand crushed tomatoes, mix well and cook for 2-5 minutes. 5. Add the chicken stock one cup at a time allowing each to come to a boil. After the second cup, add the bay leaves, let come back to boil. 6. Add about 1/2 tsp salt, to taste, and then the pigeon peas and fresh cilantro. 7. 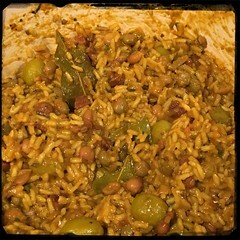 Mix well and stir frequently while the rice soaks up the liquid, add the olives (optional) cook for about 10-20 minutes. 8. Once most of the liquid is absorbed, lower the heat and let cook covered until liquid is absorbed (stir frequently), then let sit for 10-20 minutes.